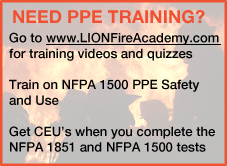 Getting safe turnouts and other PPE shouldn't be a training challenge. Do it online. Gear ships in 5 days or less. Cleaned, Inspected and Repaired as required by NFPA 1851 after EVERY rental. Rental is a fraction of the price of buying new gear. When you rent the complete ensemble, you keep the hood and gloves! Buy hoods, gloves or gear bags here. Copyright © 2017 Lion TotalCare, Inc. All rights reserved.